Always at his best as an impromptu speaker, Campbell shines in these recordings, both as a scholar and as a master storyteller. These lectures are from early in his career, including recordings of his famous lectures at the Cooper Union. 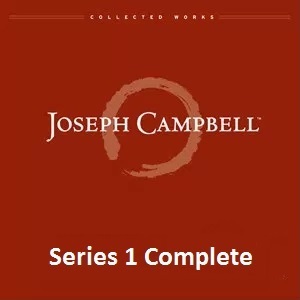 Series I consists of six volumes, each with five audio lectures (at about 60 minutes each). New! Series I is now available as a megabundle! These five talks, recorded early in Campbell’s career as a public speaker, explore the ways in which mythology serves and shapes the individual. 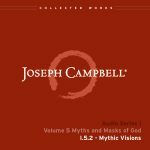 They were among those that Campbell kept in his study and used as the basis for later investigations of myth, symbolism, the psyche, and spiritual awakening. Provocative and exhilarating, full of wit and wisdom, they are windows into one of the greatest minds of our time. Early shrines and cave art suggest that human beings were aware of a grand mystery far beyond themselves more than 100,000 years ago. Modern investigations into early mythologies have revealed basic motifs and recurring themes. Joseph Campbell shows how these ancient myths and symbols celebrate the mysteries of life and can sustain us today. In Western mythologies, the individual personality is a permanent entity, surviving as a distinct and definable self even in the afterworld. In Oriental mythologies, there is no enduring personality, but rather a "reincarnating monad," an entity which goes through a series of bodies, putting them on and taking them off as if they were clothes. In this lecture, Joseph Campbell illuminates this fundamental difference between Eastern and Western beliefs and explores the way in which these ideas influence us today. Two systems of ideals--one teaching the beauty and majesty of submission to God, the other emphasizing the values of heroism and humankind--have long been at odds, especially in the Christian tradition. In this lecture, Joseph Campbell explores the concepts of Christ both as a Promethean figure and a Job figure--bringing the fire of redemption, suffering for our sins--and describes the crucifix as a synthesizing symbol, a sign of divinity and humanity alike. With the coming of scientific revolution, the notion of "truth" was replaced by a tireless quest for knowledge. Humankind saw the protective horizon of the universe disappear, replaced by ever-changing hypotheses and indistinct horizons. In this two-part lecture, Joseph Campbell considers how science has challenged human beliefs, the perceptions of the individual, and the meanings of mythology, and then explores the impact of science on the "adventurous enterprise of today." Dreams--the intimate noise of our existence--are the place where two levels of consciousness meet: the consciousness we witness, and the consciousness of our inner being. Dreams can lead us to an awareness of the divinity within us. In this lecture, Joseph Campbell explores the significance of dreams and their relationship to myths, how certain Western beliefs have translated myths into "waking consciousness" symbols, and why Eastern teachers have proved so attractive to Westerners. He then goes on to explain how yoga can give us access to "deep sleep awake" and the visions and awareness that await us there. These five talks, recorded early in Campbell’s career as a public speaker, explore the roots of myth, its psychological manifestations, and the ways in which it has expressed itself differently in India and East Asia on the one hand and Europe and the Middle East on the other. These recordings, which have been remastered, were among those that Campbell kept in his study and used as the basis for later investigations of myth, symbolism, the psyche, and spiritual awakening. Provocative and exhilarating, full of wit and wisdom, they are windows into one of the greatest minds of our time. Joseph Campbell first discusses the four functions of a viable mythology, then the fundamental difference between mythologies that affirm existence and those that reject it. With this review, he provides not only a basis for a philosophy of mythology, but also a metaphor for the crucial decision each individual must make as well: namely, whether to be reconciled with -- or to withdraw from -- life in all of its terrible glory. In the imagery of the schizophrenic's experience, Joseph Campbell recognized a synthesis of mythological motifs similar to Jung's archetypes. He recounts Dr. John Weir Perry's analysis of an individual's descent into madness: the break away or departure from everyday reality, a retreat inward with dark encounters of a symbolic kind, and finally -- in the most fortunate cases -- a return journey of rebirth and renewal. He then follows the uncanny parallels between these stages and the "universal formula" of the hero's journey gathered from mythologies of cultures around the world, and reveals how the phases of the schizophrenic's crisis correspond to the separation, initiation, and the return of the shaman's experience during his voyage into other worlds. In later years, Campbell would learn that filmmakers George Lucas and Stanley Kubrick modeled their own work on his Hero with a Thousand Faces, the groundbreaking book that explores this "monomyth" of the hero journey. 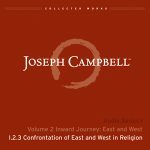 Observing that the "West" is increasingly disenchanted with traditional religious beliefs and practices, Campbell argues that the time is ripe for the cross-fertilization of Eastern and Western cultures. He presents an illuminating analogy to our present situation in the plight of the Plains Indians near the end of the nineteenth century when the old ways were disappearing with the buffalo and their old wisdom was no longer effective. For Campbell, the response of these people of the Plains is a vivid metaphor for what modern people must do. Their adoption of the peyote religion encouraged inward visionary experiences and was an example of how a people can find the sacred even when it has been lost to the society. Joseph Campbell contrasts the disintegration of man's modern religious practices with what he calls "symbolic systems of rebirth in time." For Campbell, the most fascinating systems are "myths to live by," beliefs and practices to help individuals with the frustrations in life that come from not living our "true self." The goal of the ancient discipline of yoga was important to him because it emphasizes the discovery and experience of the true self. The heart of this lecture is an explanation of the chakras in the body and the meditation techniques that connect daily consciousness to the eternal self. Through the practice of rousing the kundalini energy of the serpent coiled up at the base of the spine, it is believed that one might go to "the place beyond dream." Joseph Campbell first discusses the links between the ancient Hindu practice of Yoga and modern depth psychology. He then reviews the seven chakras (energy centers) of kundalini yoga and tells how a practitioner can raise kundalini energy up the spine from the first to the seventh chakra. If this is accomplished, the veil of Maya (illusion) is raised, and the world around us becomes transparent to the transcendent. These five lectures, recorded early in Campbell’s career as a public speaker, explore the myths and symbols of the religions in India and East Asia. They were among those that Campbell kept in his study and used as the basis for later investigations of myth, symbolism, the psyche, and spiritual awakening. Provocative and exhilarating, full of wit and wisdom, they are windows into one of the greatest minds of our time. In this talk, Joseph Campbell explores the fascinating differences between western belief systems and the wisdom of the Orient. In the West, there is an emphasis on humanity’s exile from the Garden of Eden and, hence, on our separation from God. In Oriental mythic traditions, however, there was no exile and, moreover, one can never be separate from God, because God is within every soul. Problems of alienation arise only when one has not opened up to a realization of the God consciousness within them. Joseph Campbell was fascinated by the various forms of yoga, traditional Indian spiritual practices that use meditation, physical exercises, and special breathing techniques to turn an individual's focus to an inward path. In this talk, he surveys several yogic traditions the rigorous Kuṇḍalinī Yoga; Jñāna, or “philosophical,” Yoga; and Karma Yoga, the yoga of action. While extreme psycho-physiological exercises such as those of Kuṇḍalinī Yoga might not be appropriate for everyone, he argues, each of us can shape our destiny through the practice of one or another form of yoga. 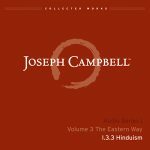 Joseph Campbell explores the rich cultural tradition of Hinduism, its basis as a tribal religion, and way in which its myths, laws and rituals shape the lives of its adherents. He speaks at length about the caste system and the structure that it gave traditional Indian life, as well as the idea of dharma (duty or virtue) as the driving ideal. He speaks too of the traditional āśramas or stages of a pious Hindu life, as one seeks to become the perfect manifestation of one’s dharma, first within the society and then outside of the culture’s boundaries in the forest. Joseph Campbell argues that, more than any other religion, Buddhism is a psychological system. Campbell then surveys the Buddha’s life, describing the crisis that led to his illumination under the Bo tree. He directs our attention to fundamental similarities between the mythological symbols of Buddhism and those of Christianity, and explores some of the various ‘ferryboats’ or yanas by which Buddhist teachers have sought to help their followers find nirvāṇa, the extinguishing of the self that brings enlightenment. When one looks at the glorious panorama of Indian art one sees a repetition of themes; beautiful themes, dependable themes, motifs that recur time and time again. And if you compare that galaxy of forms with their counterDisks in post renaissance Europe you’ll be struck by the absence of individual inflection in any of these works. Joseph Campbell begins this exploration of the ways in which the concepts of Oriental mythology are traditionally rendered by observing that, in the Orient as elsewhere, all forms of creative expression can be ranged along a continuum at one extreme are representational forms, such as portrait painting or sculptures of Buddha, that have an iconographic function; at the other extreme, are more abstracted depictions, such as brush-stroke calligraphy, that seek to express man's transcendental relationship to nature. These five lectures, recorded early in Campbell’s career as a public speaker, examine the way in myth and symbols affect and serve the individual, tying together lessons from religion, anthropology, art and modern psychology. They were among those that Campbell kept in his study and used as the basis for later investigations of myth, symbolism, the psyche, and spiritual awakening. Provocative and exhilarating, full of wit and wisdom, they are windows into one of the greatest minds of our time. In this thought-provoking talk, Joseph Campbell explores the origins of myth. Building on Jung’s observations that myths are like dreams, he argues that the source of both myth and dream is the human psyche. Myths, it could be said, are public dreams; dreams are private myths. Joseph Campbell opens this wide-ranging talk by observing that the living of life is itself a ritual act, and if society is to function, people must play various roles. Mythology gives us images of an array of roles to play, teaches us how to transcend our egos and play human roles, and helps us relate our inner worlds to outer realities. Campbell looks at the way in which twentieth-century psychology and literature have explored the ways in which myth informs our secularized society. Joseph Campbell begins by noting how a symbol can work as a kind of “automatic button” to release and channel energy. Why do some symbols seem almost universally potent? It is because such resonant symbols speak to human experiences that have remained constant throughout the ages. Campbell explores how an individual’s relationship to society changes as one grows from infancy to old age. A culture’s view of this shifting dynamic is best understood, he argues, by examining the symbols with which the society expresses its ideals. He shows how western psychologists, Diskicularly Sigmund Freud and Carl Jung, have shaped our understanding of the human experience. He concludes with a discussion of key Oriental beliefs, demonstrating how the prevailing myths and dominant symbols of each culture reinforce its understanding of an individual’s role. Joseph Campbell begins this talk by noting that a principle function of mythology is to reconcile human consciousness to the preconditions of its existence, to life that lives on life. He explores how rites and symbols, seemingly burdensome and punitive to the adolescent mind, reveal deeper meanings as the individual matures. Thus, Campbell observes, rites and symbols enable a society to affirm life and ensure that certain values are passed along to future generations. Joseph Campbell discusses what it means to live with a personal myth and what it means to live without one. In the past, every great culture grew out of a mythic base. Each had a vibrant mythology, expressive rituals, and potent symbols that infused meaning into such experiences as death and loss, pain and sorrow, fear and desire. That is not, unfortunately, the situation today. These five lectures, recorded early in Campbell’s career as a public speaker, explore what it means to approach and experience the divine. 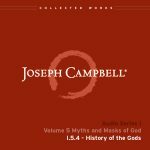 They were among those that Campbell kept in his study and used as the basis for later investigations of myth, symbolism, the psyche, and spiritual awakening. Provocative and exhilarating, full of wit and wisdom, they are windows into one of the greatest minds of our time. 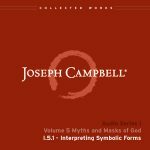 Joseph Campbell uses the biblical tale of the Garden of Eden as the starting point for an exploration of how we interpret symbolic forms. Observing that certain Western religious traditions view this story of Man’s “fall from grace” as a recounting of an actual event, he insists that this literal, historical perspective provides a limited understanding of the Garden story. 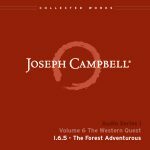 Joseph Campbell first distinguishes myth from the adventure story and the fairy tale. Then he describes the way in which myths are true. Though people who live by a mythology might not regard their myths as empirically true, mythic images continuously penetrate their psyches. So these people are living, Campbell argues, in a mythological realm, where their normal sense of space and time is suspended, and their visions in that dimension are therefore true. Joseph Campbell charts the historic evolution of our experience of the divine. He describes the views of early hunters on the open plains, who deified their animal providers; the different reality of denizens of tropical forests, whose sacrifice rituals reflect the world around them; and the desire of inhabitants of the first villages to harmonize daily life with the mathematical progression of planets and stars. Common to these mythic visions, he observes, is the idea that the divine is “out there” in some form. Joseph Campbell explores the original sources of various images of divinity in religions around the world. 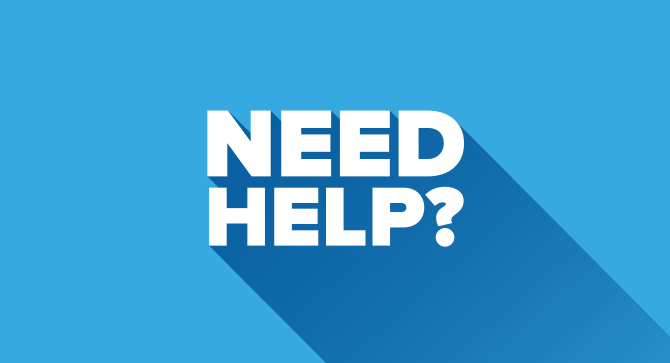 No experience, he reminds us, can be fully understood except by the person who has had that experience; and nowhere, he observes, is this limitation more apparent than in the context of religious experience. As a result, the poetic images used to describe such experiences are often misunderstood by others. Joseph Campbell explores the origins of important Judeo-Christian religious motifs. He interprets a range of religious symbols, from the western crucifix and its associations with the tree of life to the “fear not” mudrå the gesture of raised hand with exposed palm in eastern sacred sculpture. A central concern of all great mythologies, he notes, has always been the dynamic relationship between life and death. These five lectures, recorded early in Campbell’s career as a public speaker, explore how the modern European cultural explosion from the Middle Ages to the present, with its emphasis on the individual’s quest for fulfillment, has expressed itself mythologically. Provocative and exhilarating, full of wit and wisdom, they are windows into one of the greatest minds of our time. Throughout the myths of the world, certain elementary ideas appear that transcend all borders and languages, yet these universals are always clothes in the historical and social trappings of their native culture. In this far-reaching talk, Campbell explores the dynamic balance between these universals and their local manifestations by focusing on the central myths of the four ancient centers of high civilization: China, India, the Near East, and Europe. Central to his exploration is the way in which their primal myths continue to or fail to serve them to this day. Love is central to all of the world's mythologies. Why does love—that most transcendent, yet most personal, of emotions—occupy such a primary place in our most fundamental myths? The Greeks saw Eros, the god of love, as both the oldest of the gods and as the infant reborn “fresh and dewy-eyed in every loving heart.” In one Persian myth, love is the reason for Lucifer's fall he loved God so much he would not bow to God's creation, Man. In Dante's Divine Comedy, the poet has a vision of a strand of love connecting the lowest depths of Hell, through Purgatory and Heaven, to God Himself. The high period of the Arthurian romances is exactly that of the building of the great cathedrals that wonderful century from A.D. 1150 to 1250. The grand tales of Arthur and Guinevere, Tristan and Iseult, Galahad, and Percival express the spirit of their time as passionately as their great stone counterparts at Chartres and Notre Dame. In this talk, Joseph Campbell explores this cultural explosion, tracing social, mythological, and cultural clues in the stories back to the prehistoric Celts and to classical China. Galahad is a word from the Old Testament that means Mountain of Testimony; [Sir Galahad] is a mountain of testimony to Christ. The whole tradition of the virgin knight as the Grail knight belongs to a Cistercian monastic line. Joseph Campbell explores the historical roots of the Grail legend. He discusses the development of the Roman Catholic Church in the Dark Ages, and shows how new conceptions of love, marriage, and worship gave rise to a secular “religion,” that of courtly romance. He then examines the quest for the Holy Grail, both as an expression of these new ideas of love and as a reaction against the dogmatic practices of the medieval Church. Finally, in his own inimitable style, he recounts the Grail Legend. Joseph Campbell concludes the story of Percival’s exploits. Plagued with doubt, beset with travail, and tormented by temptation, he wanders the wilderness for five years, steadfastly pursuing his quest for the Holy Grail. It is in the forest adventurous, Campbell reminds us, that we meet our adventures when we are ready for them. Our Grail hero is at last united with his brother, succeeds in his quest by virtue of his noble character, and becomes the Grail King. Campbell continues his investigation of the Grail Legend by exploring a central theme, that of the Waste Land, the place where everybody is living an inauthentic life.